on't throw away your Ham Bone! Instead of using ham hocks, use your leftover ham bone from Easter! 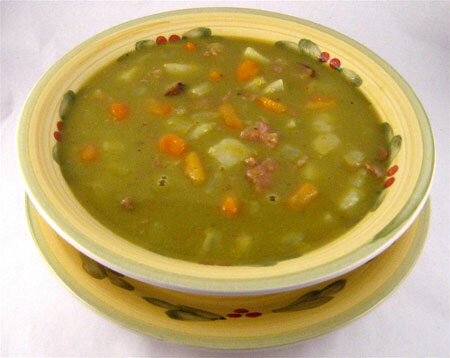 In a large soup pot or Dutch oven combine the peas, hocks, onion, celery and carrot. Tie the parsley, thyme, and bay leaf together with kitchen string. Add the herb bundle, water, and salt, bring to a boil over high heat. Lower the heat to a simmer, cover, and cook for 1-1/2 hours or until the peas are tender. Remove the pot from the heat and remove the hocks. Cool. Remove the meat from the hocks, discarding the bones, fat and skin. Cut the meat into cubes. Remove the herb bundle and discard. Puree the soup with a hand held blender or in batches in a blender. Heat the soup to a simmer with the meat and season with salt and pepper to taste.